Iron Winter is the third book in the alternate history Northland trilogy by Stephen Baxter, set in a world where the prehistoric peoples of Doggerland, a region of land which once linked Britain to the rest of Europe, built an immense wall to hold back the sea, and with it a powerful civilisation. 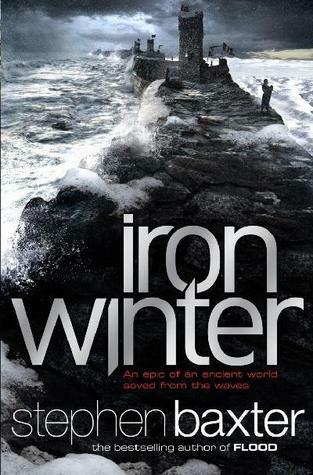 Iron Winter follows the stories of several Northlanders and others, millennia after the wall was built, as they struggle to survive amidst the start of an ice age – with glaciers advancing, huge numbers of people migrating and great empires going to war. Pyxeas is a scholar in search of answers; Rina, once an Annid, a leader of Northland seeks to protect her family by migrating to Carthage. Her son Nelo likes nothing more than drawing and painting the people and landscapes that inspire him, but finds himself witness at the heart of the big events of the world. With the multiple perspectives of characters experiencing different facets of the disaster, Baxter creates a depth to the story that grounds it in humanity. Each character has unique experiences of the advancing winter, and drives their own story – and influences those of others – through their desires, wants and flaws. This is not merely the story of climate change, mass migrations, plague, and empires in conflict, it is the story of individuals battling to survive, to understand, to record and to prosper under circumstances they are not prepared for and could never have predicted. The weakness, with regards the characters, is emotional depth. While each character has goals and motivations, flaws and skills, they lack emotional depth. The sheer number of characters cannot be blamed for this, I think, since other facets of their personalities are clear. The result is that the emotional moments – the moments of loss and grief, of fear and revelation – don’t have much impact. Iron Winter is quite a long book, dense with story and action. There are perhaps some scenes which could have been cut without much lost, and others which dragged, but overall the story is well-paced, with strong if emotionally shallow characters and plot lines which pull the reader onwards. The story feels organic, the plot developing naturally on the basis of the decisions of the characters. I rate Iron Winter 8/10. It is a powerful and dramatic story with varied characters giving unique perspectives, but lacks emotional depth. It’s a good read, and a strong conclusion to a fascinating trilogy.